Authors: Oliver D. Elbert et al. As the joy from yesterday’s Nobel Prize announcement continues to linger far and wide, I’d like to lend words to my delight by talking a bit about black holes. And LIGO. Well, black holes seen(heard?) by LIGO. Motivated by this curiosity, the authors of today’s paper have analyzed the gravitational wave signals from the first three binary black hole mergers detected by LIGO, and developed an understanding of their characteristics in the context of our current knowledge about galaxy formation. Based on what we know about the formation of stars, the relationship between their ages/metallicities and the mass of their host galaxy, as well the overall number density of galaxies in our universe, the authors infer the age and mass distribution of black holes in different types of galaxies. In their study, however, they assume that the extant population of black holes is attained solely from the death of massive stars, and does not feature any primordial black holes, allowing them to make confident estimates from reasonably well quantified galaxy observables. How many black holes in store? Through their study, Elbert et al. 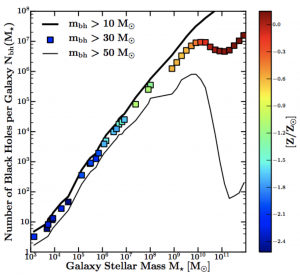 found out that the total number of black holes of all masses increases linearly with host galaxy mass for galaxies with stellar masses ≲1010 solar masses (M⊙); see Fig 1. For instance, the Milky Way would host up to 100 million black holes, 10 million of which would weigh about 30 M⊙ such as those detected by LIGO, whereas dwarf satellite galaxies like Draco orbiting the Milky Way, may be home to just about 100 black holes. Further incorporating the relationship between the mass and metallicity of a galaxy in their analysis, the authors predict that most low-mass black holes (~10 M⊙) should reside in massive galaxies like our own. This is because larger galaxies have more metal-rich stars that undergo vigorous mass-loss over their lifetimes, thereby ending up as low mass black holes. Contrarily, dwarf galaxies predominantly host metal-poor massive stars that do not shed as much of their mass, and hence have more mass ending up into the black holes (~50 M⊙). How often do they collide? In the case of binary black hole mergers, it can often be difficult to say whether the pair of merging black holes was created way back in the past and took a long time to merge, or whether it was recently minted and merged soon after. To demystify this situation, the authors, in addition to the original black hole census, also sought to develop a framework for predicting the frequency of future merger events. Depending on the probability that certain black holes will occur in binary systems and an estimate of the typical timescale of their merger, their results indicate that a range of merger efficiencies (0.1-1%), albeit very low, is needed to explain the characteristics of existing LIGO detections. Conversely, fixing the value of merger efficiency would necessitate a range of merger timescales to accommodate the data. Constraining the value of both the merger efficiency and merger timescales would require knowledge about the size of host galaxy population (massive vs. dwarf). For a nominal efficiency of 1% applied to the current detections, the results from this study indicate a merger density of 12–213 per cubic gigaparsec, or a merger timescale of ≲5 Gyrs, for ~50 M⊙ black holes. Such a high merger density suggests that mergers involving ~50 M⊙ black holes should be detected by LIGO within a decade. With another merger already under LIGO’s belt since this study was published, impending detections seem galore. There is no doubt that enthusiastic scientists all over the world will have a lasting opportunity to shine light on the exact physics driving the exotic phenomena that are binary black hole mergers.